In a Rider-Waite-Smith tarot deck, the Magician is a major arcana card. This card appears in the same position in most decks based on the Latin tarot (also known as the Tarot de Marseilles). 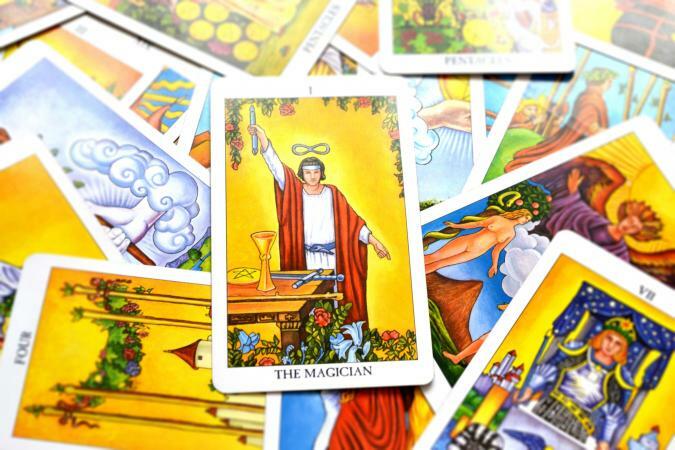 When the Magician appears in a spread or reading, he brings with him specific symbolism and meaning. The Magician stands in a verdant garden of white lilies and red roses. In his right hand, he holds a double sided wand pointed up at the sky. His left hand points downward towards the earth. Floating above his head is the infinity sign, and in front of him on a table are the four symbols for tarot suits, a wand, a cup, a pentacle, and a sword. The magician wears a white tunic with a red robe. Around his waist is a snake swallowing its own tail (ouroboros), which he wears as a belt. Each of these images offer symbolic clues about the meaning of the Magician. When major arcana cards appear in a reading, it means the querent needs to pay special attention to the messages they bring. The Magician is the I (1) card in the major arcana. Although his number is I, the Magician is actually the second card in the major arcana after The Fool (0). His placement after The Fool is not coincidence. Instead, he is the manifestation of The Fool later in his journey after he has combined the wisdom and experience he has gained with his initial optimism. In numerology, the number I represents new beginnings and opportunity. The number also indicates the presence of the raw materials for the process of creation. In this position, the Magician has everything he needs to begin the alchemical process of creating what he focuses on out of the raw materials he has available. On the table in front of him are laid out all of the tools for creation, represented by each of the symbols of the four tarot suits. Each stands for one of the classical elements. Swords represent the element of air, wands represent the element of fire, cups represent the element of water, and pentacles represent the element of earth. These are the Magician's tools of creation, ready for his use. The Magician stands with his right arm, which represents his conscious, rational brain, pointing towards the heavens. In it, he is holding a double-tipped wand, which is his primary tool of creation. This indicates he is reaching to higher realms consciously, both sharing his process of creation and seeking assistance from the Divine. His left hand, which represents his subconscious mind, points towards the Earth, meaning he is channeling the higher wisdom he receives downward into the earthly plane. The infinity sign above his head symbolizes the Magician's infinite capacity for creativity when he connects with a higher source. The ouroboros represents the ability to re-create and reinvent endlessly. In the garden are red roses and white lilies, representing passion and integrity. These colors are also reflected in the Magician's clothing. He clothes himself in and surrounds himself with these two traits, which are the primary qualities he engages as he creates. Together, the symbols paint a picture of what the Magician means when he appears in a tarot spread. When he comes up in a spread, he represents creation and inventiveness, as well as the beginning of or an ongoing process of creation using the tools available. The Magician tells the querent it is time to take action and begin to create the life he or she envisions. The reversed Magician is not a creator of integrity, but rather a joker or trickster. Therefore, if he appears reversed in a spread, he is telling the querent he or she is being misled or manipulated by a clever trickster or suggesting the querent is behaving in such a manner as to mislead or trick another. It may also suggest creative blockage or creation embarked upon frivolously or for the wrong reasons. When the Magician appears in other decks, his meaning is the same as above. You may see him in other decks as The Juggler or The Magnus.